Thursday morning saw a sea change in perspectives on fire behavior in the United States! 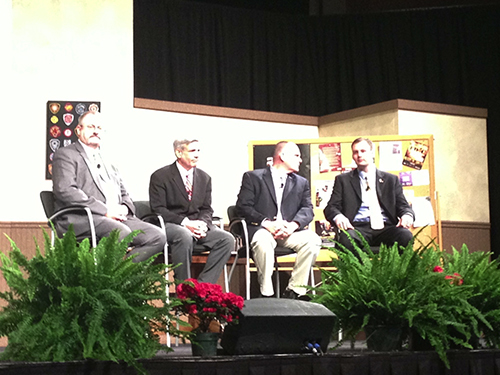 Over 2500 people were in the big room at FDIC to hear BC George Healey (FDNY), Dan Madryzkowski (NIST), Steve Kerber (UL), and LT John Ceriello (FDNY) talk about fire research conducted on Governors Island in New York. The demonstrated fact that flow path influences fire spread and not application of water. You can’t push fire with water applied into the fire compartment. Several years ago, who would have thought that a presentation on fire dynamics and research would have drawn this number of people to a presentation at FDIC. Kudos to FDNY, NIST, and UL for their ongoing work in developing an improved understanding of fire dynamics and firefighter safety. I had the opportunity to visit with Captain Mike Sullivan with the Mississauga Ontario Fire Department while at FDIC and we are continuing our dialog with another series of questions related to the characteristics of water fog and its use of a fog pattern for self-protection when faced with rapid fire progression in a structure fire. The next three questions deal with using a fog stream for protection. In the IFSTA Essentials of Firefighting 5th edition it states that “wide fog patterns can also protect firefighters from radiant heat”, however in the IFSTA Essentials of Firefighting 3rd edition it states “In the past, water curtain broken stream nozzles were commonly used for exposure protection. However, research has indicated that these nozzles are only effective if the water is sprayed directly against the exposure being protected”. This tells me that fog patterns cannot protect from radiant heat. Another question for which the answer is “it depends”. Both statements are correct (in context). Water droplets reduce radiant heat by absorbing energy and scattering the radiant energy. The effectiveness of these mechanisms depends on droplet size, wavelength of the radiation, geometric dimensions of the water spray, and density of the fog pattern. To put this in context, firefighters use a water spray for protection when approaching a flammable gas fire. In this context, the high density of the spray in proximity of the nozzle is quite effective. 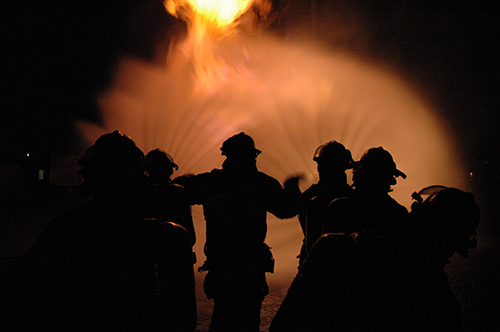 In contrast, application of a water spray between a fire and exposure is likely to be much less dense, and thus less effective in protecting the exposure than simply applying water to the exposure to keep its temperature <100o C.
In the past there was a belief (which some still believe) that if you find yourself in a bad situation in a house fire you can simply switch to a wide fog and it develops an “umbrella of protection from the heat and fire”. I believe this to be false. What I do think has happened in the past is that firefighters have found themselves in a room with extreme rollover or even had pockets of unburned gas igniting around them. When they used this technique they didn’t protect themselves with an umbrella of fog protection but they cooled the smoke layer and made the situation better. This also is an interesting question, there are incidents where firefighters have opened the nozzle when caught in rapid fire progression and have survived (not necessarily uninjured), likely due to the cooling effects of the water spray. However, I would agree that this does not provide “an umbrella of protection” like a force field that provides complete protection. The benefit is likely by cooling of the hot gases above and potentially controlling some of the flaming combustion in the immediate area. However, as continuous application will likely not only cool the hot upper layer, but also generate a tremendous amount of steam on contact with compartment linings, the environment will not be tenable in the long term. However, this environment is likely more survivable than post-flashover, fully developed fire conditions. Much the same as in driving or riding in fire apparatus, the best way to avoid death and injury in a crash is to not crash in the first place. If firefighters recognize worsening fire conditions, they should cool the upper layer to mitigate the hazards presented, if this is ineffective, withdrawing while continuing to cool the upper layer is an essential response. My last comment on this; and this is where I am not really sure. If you are in a situation where you need to back out quickly, would it work to use a fog stream to push the heat away as you are reversing out of the structure? You would only do this for a short time while you retreat. If you cannot put water on the fire to achieve control (shielded fire) or the heat release rate (HRR) of the fire exceeds the cooling capacity of your stream you are in a losing position. When faced with rapidly deteriorating thermal conditions, it is essential to cool the upper layer. It is important to note that cooling, not simply “pushing the heat away” is what needs to happen in this situation. This action reduces heat flux from both convective and radiant transfer. Adequate water must be applied to accomplish this task, as temperature increases so too does the water required. Long pulses provide a starting point, but the pulses need to be long enough to deliver the required water. If needed, flow could be continuous or near continuous while the crew withdraws. In much the same manner a crew working with a solid stream nozzle would operate the nozzle in a continuous or near continuous manner and rotate the stream to provide some cooling to the upper layer while withdrawing. 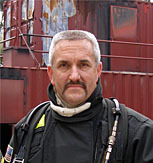 There are those who believe that you can use a fog stream to protect yourself in a house fire by pushing the heat away from you as you advance on the fire. I believe you can push heat away from you and it happens in 2 distinct ways, the wide fog with the entrained air is literally pushing the heat away from you and you have now created high pressure in an area that was low pressure (typically you are near an open door) so you have effectively changed the flow path. Having said this, I feel the benefits are short lived. With this fog pattern you will also be creating a lot of steam which will continue expanding until it’s temperature reaches equilibrium with the rest of the fire compartment (expansion could be as high as 4000 times). With all this pushing and expansion you are now creating high pressure in an area down stream from you that had previously been a low pressure area. As we know, everything is trying to move from high to low pressure, now the low pressure area is directly behind the nozzle. Now you are in a situation where not only is the heat coming back behind the nozzle but there is an enormous amount of steam being created and heading your way. 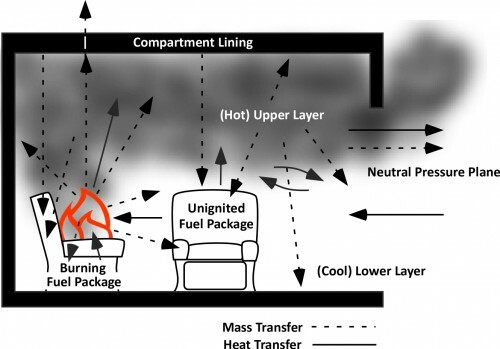 The confusion here is most likely with the techniques we use when practicing for gas fires, we do this outside where there is an endless amount of space to push the heat away (I read this part in a good article in Fire Engineering). The impact of continuous application of a fog stream (or any stream for that matter) as you advance is dependent on a number of factors, principal among which are the flow path and where steam is produced (in the hot gas layer versus on contact with surfaces). Continuous application is likely to result in vaporization of a significant amount of water on contact with surfaces; this will result in addition of steam to the hot upper layer without corresponding contraction of the hot gases that results from vaporization of water while it is in the gases. Without ventilation in front of the fog stream (or any stream for that matter), this can result in a reduction in tenability. However, when ventilation in front of the stream is provided, a combination attack (using a fog pattern, straight, or solid stream) can be quite effective for fully developed fire conditions. I was hoping you could elaborate on the term “painting”. It is defined as a “gentle application of water to cool without excess steam production”. The hard part as a firefighter is the word “gentle” as this word doesn’t register in firefighter lingo. I can see this during overhaul but was hoping you could elaborate. The way that I typically explain the concept of “gentle” is using a fire in a small trash can or other incipient fire inside of a building. If you use a hoseline to extinguish this fire, it is unlikely that you will need a high flow rate or application of the stream with the bail of the nozzle fully open. It would be appropriate to simply open the nozzle slightly on a straight stream and apply a small amount of water to the burning fuel. Surface cooling can be done using a vigorous application from a distance when faced with a well involved compartment. In this situation, the reach of the stream is appropriately used to extinguish the fire and cool hot surfaces from a distance to minimize thermal insult to firefighters while quickly achieving control. However when faced with hot and pyrolizing compartment linings or contents, it may be useful or necessary to cool these surfaces from closer proximity. In this case applying water with force will result in much of the water bouncing off the surfaces and ending up on the floor. Painting involves using a straight stream or narrow fog pattern with the nozzle gated back to provide a gentle application resulting in a thin layer of water on the hot surface. As you note, this is most commonly used during overhaul, but could be used anytime that there is a need to cool hot, pyrolizing, but unignited surfaces. Next week Mike and I will conclude this series of FAQ with a look at pyrolysis and flow path. 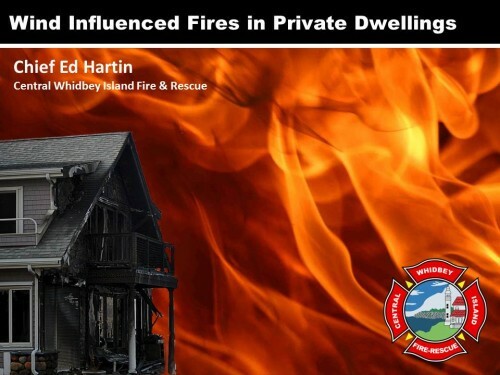 Captain Mike Sullivan with the Mississauga Ontario Fire Department and I are continuing our dialog with another series of questions related to the science behind fire attack and fire control methods. Mike’s next several question deal with gas and surface cooling. I know the best way to extinguish a fire is to put water on it but my questions below deal with a situation of large, open concept homes where you can see the entire main floor except the kitchen cooking area, in many cases this area is not separate from the open floor plan but around the corner so we can’t hit the fire until we get around that corner. My questions are all geared around how to cool the environment as you make your way to the fire (if you need to go to the very back of the house to get to the fire, fire can’t be seen). When you answered the question about the effects of flowing a straight/solid stream across the ceiling it sounds as if this is really only surface cooling and not effectively gas cooling. If this is true then I was wondering what the value of doing this is, what are the main benefits of cooling the ceiling, walls and floor (and any furniture etc. the water lands on)? Also, what do you recommend to those departments that only use solid bore nozzles? Use of a solid (or straight) stream off the ceiling has some effect on cooling the gases, but this is limited as the droplets produced are quite large and do not readily vaporize in the hot upper layer (great for direct attack, but not so much for gas cooling). The value of doing this is that any energy taken out of the hot upper layer (buy cooling the gases or by cooling surfaces and subsequent transfer of energy from hot gases to the cooler surfaces) will have some positive effect. In addition, hot combustible surfaces, depending on temperature are likely pyrolizing and adding hot, gas phase fuel to the upper layer. Cooling reduces pyrolysis and the fuel content of the smoke overhead. The following video of the “Nozzle Forward”, Aaron Fields, Seattle Fire Department demonstrates some excellent hose handling techniques and also provides an illustration of how a solid stream nozzle can be used to cool hot gases by breaking up the stream on contact with compartment linings. Have a look at the video between 2:00 and 2:30 where the nozzle is being rotated as in a combination attack while advancing down a hallway. Note that the stream breaks up on contact with the ceiling and walls, providing a distribution of large droplets in the overhead area. 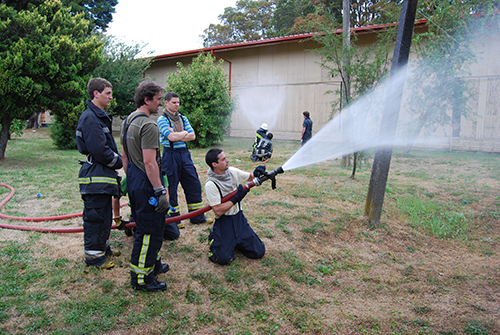 This technique can be quite effective when faced with a large volume of fire and ventilation is provided in front of the fire attack. However, if the hallway is not involved in fire, but there is a hot layer of smoke overhead, this approach is less effective as large droplets are less efficient in cooling the hot gases and much of the water will end up on the floor, not having done appreciable work. While this will likely generate some hate and discontent, I would recommend that departments using only solid stream nozzles reconsider their choice. This type of nozzle has a number of great characteristics, but also has a number of significant limitations, principal among which is limited ability to cool the hot upper layer when dealing with shielded fires. That said, the firefighter riding backwards or company officer in the right front seat may have limited impact on this decision (at least in the short term). If all you have to work with is a solid stream nozzle, directing the stream off the ceiling to break up the pattern and provide limited gas cooling when dealing with extremely hot gases overhead are likely a reasonable option. I understand how penciling a fog stream in the hot gas layer is the best way to cool the gases. My concern is this, where I work there are many new homes with open concept, large rooms and little compartmentation. I like the idea of cooling the gases above my head but I still have a large room full of gases that could still flash. Sure I’m cooling the gases around me but if the gases at the other end of the open space flash, I am still in the same room and in trouble. I would prefer to cool that area before I get there. What are your recommendations for this situation? We also have quite a few large residential occupancies with open floor plans. The issue of large area or volume compartments also applies in commercial and industrial building as well. Gas cooling simply provides a buffer zone around the hose team, but other than in a small compartment does not change conditions in the upper layer throughout the space. Gas cooling must be a continuous process while progressing towards a shielded fire. The upper limit of area (or more appropriately volume) is an unanswered question. My friend Paul Grimwood, Principal Fire Safety Engineer with the Kent Fire and Rescue Service in the UK holds that the upper limit with a relatively normal ceiling height is approximately 70 m2 (753 ft2). Paul’s perspective is anecdotal and not based on specific scientific research. However, this is not unreasonable, given the reach of a narrow fog pattern and vaporization of water as it passes through the upper layer. Given the higher flow rates used by the North American fire service, it may be possible to control a somewhat larger area than Paul suggests, but this remains to be determined. As to an answer to this problem, pulsed application does not always mean short pulses, multiple long pulses with a narrow pattern or a sweeping long pulse may be used to cover a larger area. In addition, large area compartments or open floor plan spaces may require multiple lines to adequately control the environment. 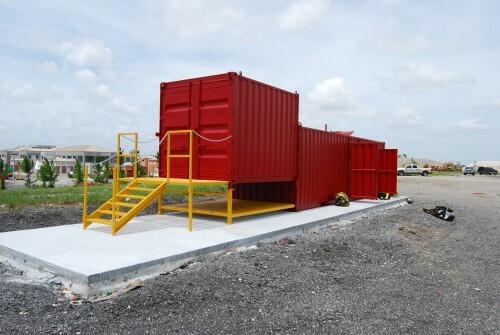 The purpose of the backup line is to protect the means of egress for the attack line and this is of paramount importance in an open plan building. The following two videos demonstrate the difference between short and long pulses. At 115 lpm (30 gpm) the flow rates in these two videos are low by North American standards, but are fairly typical for gas cooling applications in many parts of the world. Short pulses can be used effectively up to approximately 570 lpm (150 gpm) with minimal water hammer, for higher flow rates, long pulses are more appropriate. When we do these quick bursts of fog to cool the gases we are not using much water compared to the feeling that the best way to handle this is to flow a large amount of water and basically soak the entire area down before you advance through it. I was hoping you could comment on this. As noted in the answer to your previous question, pulses are sometimes, but not always quick. In a typical legacy residence (small compartments) short pulses are generally adequate to cool hot gases overhead. 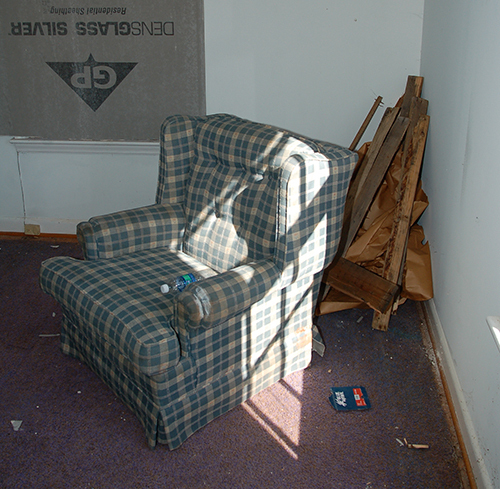 When accessing a shielded fire, and cooling the hot gases overhead it is not generally necessary to cool hot surfaces and fuel packages such as furniture (it may be a different story in the fire compartment). Water remaining on the floor or soaked into contents did not do significant work and simply added to fire control damage. We should not hesitate to use an adequate amount of water for fear of water damage, but tactical operations should focus on protecting property once (or while) we are acting to ensure the safety of occupants and firefighters. 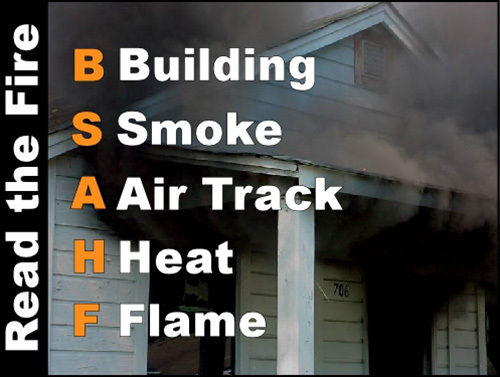 We often enter house fires where the house is full of smoke but the smoke is not necessarily very hot. In these cases we would not normally cool the gases. From what we understand now, smoke is fuel and with open concept homes this smoke could ignite close to the fire therefore igniting the smoke nearer to us. What I was wondering is what are you teaching in regards to cooling the smoke, do you do it only when you feel a lot of heat or start cooling regardless? As the temperature of the upper layer drops, the effectiveness of application of pulsed water fog diminishes. That said, if the upper layer is hot enough to vaporize some of the water (i.e. 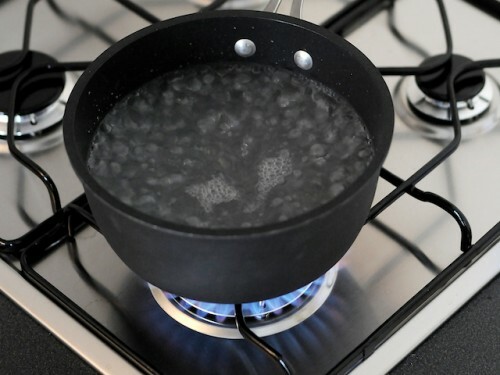 above 100o C), application of water will further cool the gases and provide some thermal ballast (the water will have to be heated along with the gases for ignition to occur). When presented with cold (< 100o C) smoke, firefighters still face a hazard as gas phase fuel can still be ignited resulting in a flash fire (if relatively unconfined) or smoke explosion. The only real solution to this hazard is to create a safe zone by removing the smoke through tactical ventilation. Mike and I will continue this dialog next week with a discussion of the protective capabilities of fog streams.